SAXON kicked off 2015 with the re-release of two classic collections, each covering significant career highlights as well as offering something new in their 2015 versions. The re-release of their greatest hits album Heavy Metal Thunder made its market re-entry together with a brand new bonus CD, Live At Bloodstock, in addition to re-issue of The Saxon Chronicles, a double-disc DVD which now also includes a bonus CD titled Rock’n’Roll Gypsies 1989 Live. 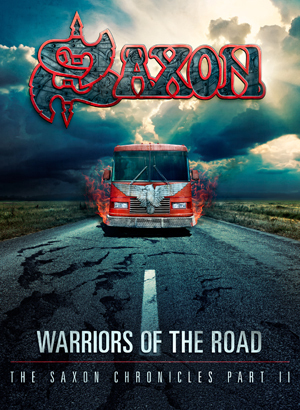 Now, SAXON is making another big announcement for this spring – the British heavy metal legends will embark on a nine-date U.S. tour, dubbed the “Warriors Of The Road” tour, beginning in May. The run includes support from ARMORED SAINT on most dates, and also includes select one-off dates with JUDAS PRIEST. The tour kicks off in New York City at BB Kings on May 12th and features a stop at Rock On The Range. The tour closes in Los Angeles, CA at the House of Blues on May 30th.